Recruiting for this regiment began in September, 1861, under the call of Col. Jesse Bayles, who organized the regiment at the fair grounds at Louisville. Associated with him were Lieut. Col. Jacob Ruckstul, Capt. John F. Duncan and James O’Donnell, who afterward became captain and was also active in the first week of organization and remained with the regiment during its entire career, though sometimes serving on brigade staff. The companies came from Louisville and Jefferson county, and from Spencer and Bullitt. The regiment was first sworn in by Maj. John W. Barr, and first paid off in its camp at the fair grounds by R. J. Menefee, of Louisville. It was held at Louisville until January 6, 1862, when it marched to Bardstown and went into a camp of instruction, being in the brigade commanded by Gen. Wm. H. Lytle. On the 26th of March it left Bardstown and proceeded to Nashville. From thence it went to Wartrace, Tenn., April 8th. It remained in that part of the state during the summer of 1862. In May, 1862, Col. Green Clay Smith became colonel of the regiment, but in the same month he was promoted to brigadier general. While he was in command the 4th was in several engagements with the Confederate cavalry in Tennessee: particularly one at Lebanon with Morgan, and for gallant service there Col. Green Clay Smith was made brigadier-general. July 13th the regiment marched to Tullahoma, where it remained until August. It was then sent to Manchester, and from thence to Murfeesboro, being all the time actively engaged in scouting and reconnoitering. While at Murfreesboro Gen. Bragg’s movement to Kentucky began, and the 4th was employed to cover the movement of Buell’s army in pursuit as far as Bowling Green. It was held at that place with other troops for the protection of the railroad and that section of the country, while the main army proceeded on to Louisville. After the expulsion of Bragg from Kentucky the 4th continued in service along the southern border of the state until February, 1863. During this period it was at Bowling Green, Glasgow, Russellville, Hopkinsville and many other points, and was in the division commanded by Gen. Dumont, the regiment being under Col. Bayles. February 9, 1863, the 4th moved from Bowling Green to Nashville; from thence to Murfreesboro. At that time it was in Col. Minty’s brigade, Stanley’s division. February 27th, it marched to Franklin, being employed with other troops to guard the right flank of Rosecran’s army, then lying at Murfreesboro. In March it was engaged in several spirited contests with Van Doren’s and Forrest’s troops. Among these may be mentioned the fight at Thompson’s Station, March 5th; the expedition to Columbia under Gen. Green Clay Smith, March 19th, and the fight at Brentwood, March 25th. 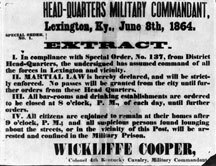 April 14, 1863, Col. Bayles resigned and was succeeded by Col. Wickliffe Cooper, who had been a lieutenant in the 20th Ky. Infantry, and had been lieutenant-colonel of the 4th Cavalry. Being now made colonel of this regiment he proved himself a most gallant and efficient cavalry officer. June 7th, the 4th engaged with the enemy at Franklin, when in a charge made by the regiment Col. Cooper was severely wounded and one man was killed. June 11th it was again engaged at Triune, with loss. June 23d it was engaged at Unionville. In the organization of Rosecrans’ army, June 30th 1863, the 4th was in the 1st Brigade (Col. Campbell), Mitchell’s division, Stanley’s cavalry corps. 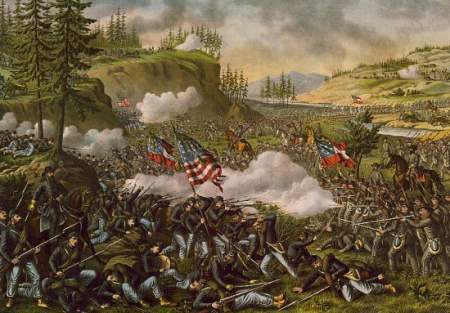 August, 1863, the 4th advanced with the army of the Cumberland, under Gen. Rosecrans, in the movement upon Chattanooga, which resulted in the battle of Chickamauga. It would be impossible to enumerate all the experiences of this activ e campaign. From the last of July until August 9th it was encamped at Gum Springs. From thence it moved by way of Fayetteville, Tenn., and Huntsville, Ala., to Maysville, Ala. August 27th marched to Caperton’s Ferry; crossed the Tennessee river to Valley Head, September 1st. On the 3d crossed Lookout Mountain, marched through Alpine to Summerville, Ga., returned to Valley Head, September 15th. On the 19th, the day the great battle of Chicamauga opened, the 4th marched to Crawfish Springs, when it was fiercely engaged with Confederate cavalry under Gen. Wheeler. 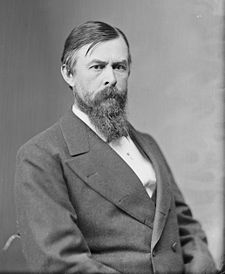 In the report of Col. Watkins he says that when he discovered the enemy he drew up the 4th, 5th and 6th Ky. Cavalry in line, then advanced to the Chattanooga road. Then Capt. O’Donnell, of his staff, reported the enemy advancing. In the fight that ensued he was flanked and fell back. The 4th formed across the road at Lookout church, the 6th passing on. Then “the 4th fell back slowly, fighting with desperation, and rallied on the 6th, when the two regiments held the enemy in check fully 20 minutes. Then they were again flanked:” retreating again, they again rallied and repulsed the enemy. In this desperate fighting the 4th lost four officers, Capts. Rodgers and Lewis, Lieuts. Cohen and Curtis, and over 90 men wounded and missing. It continued to cover the retreat to Chattanooga, arriving there September 22d. On the 25th, it marched to Bellefonte, October 2d, for Caperton’s Ferry, where it remained till December 2d. It then marched by way of Chattanooga to Rossville, Ga., arriving Dec. 5th, and constituted the extreme outpost of the army. It remained at Rossville until January 6, 1864, when it re-enlisted in the veteran organization. Up to this time the 4th Cavalry had been in numerous engagements and its service had been unusually active. In the veteran organization the field and staff were: Col. Wickliffe Cooper; Lieut.-Cols. Llewellyn Gwynne, George Welling; Majs. Sidney S. Lyon, John F. Weston, John M. Bacon; Adjutant J.B. Boatgerman; Quartermaster Charles H. Swift; Surgeon Charles H. Butler. After the furlou gh incident to the veteran organization the regiment rendezvoused at Lexington, Ky., and immediately went to Nashville, and from thence marched on foot to Chattanooga, when it was mounted and camped in Wauhatchie valley. During the career of the regiment from this time to the end it was commanded by Cols. Cooper, Gwynne and Welling successively, and also at times by Majs. Weston and Bacon. It was in the brigade of Col. L. D. Watkins, Gen. Ed McCook’s division of Gen. Elliott’s cavalry, in Sherman’s army. On the 24th of June, 1864, a part of the 4th cavalry, under command of Capt. John M. Bacon, had a remarkable experience at Lafayette, Ga. The detachment was at that place with similar detachments of the 6th and 7th Ky. Cavalry regiments, all under Col. Watkins, the whole numbering 450 men. Col. Watkins, in his report, says this force of 450 was attacked by Gen. Pillow with a force of 3,000. Gen. Pillow, in his report, says he attacked with 1,600 men. The fight took place in the town about 3 o’clock a.m. As soon as the firing began Capt. Bacon, with his men, took possession of the court house and jail, and barricaded the windows and doors with sacks of corn. During the fight all of Col. Watkins’ men occupied these buildings and successfully fought off their assailants, who withdrew from the contest and the 4th Ky. Mounted Infantry coming up, under Cols. Croxton and Kelly, the withdrawal became precipitate even to a panic, as reported by Gen. Pillow. The 4th Ky. Cavalry then took part in all the cavalry operations of the Atlanta campaign, and was repeatedly complimented by Gen. Sherman for its efficiency. It was engaged at Resaca and other places in this campaign. After the capture of Atlanta the regiment accompanied Sherman’s army in its operations in Northern Georgia, in October, 1864, and when the march to the sea began it was ordered to Nashville to take part under Gen. Thomas in the campaign against Gen. Hood. It was then in the cavalry command of Gen. J. H. Wilson, and bore its part in the operations in Middle Tennessee, resulting in the battles of Franklin and Nashville. Just preceding the battle of Nashville the 4th Cavalry was sent with a strong cavalry force under Gen. Ed McCook to oppose Gen. Lyon, who had moved into Kentucky. This command proceeded to Hopkinsville and other places in Southern Kentucky, and forced Lyon to withdraw from the state. After the battle of Nashville, December 16, 1864, the regiment was sent to Waterloo, Ala. It then took part in Wilson’s celebrated expedition through Alabama and Georgia. It was in the advance at Montgomery and captured the place and held it until supporting troops came up. It went through Georgia to Tallahassee, Fla., and returned to Macon, Ga., when it was mustered out of service, August 21, 1865, having served four years. Organized at Louisville, Ky., December 24, 1861. Moved to Bardstown, Ky., January 6, 1862, and duty there until March. Unattached Cavalry, Army of the Ohio, to September, 1862. 1st Brigade, Cavalry Division, Army Ohio, to October, 1862. District of Louisville, Ky., Dept. Ohio, to November, 1862. District of Western Kentucky, Dept. of the Ohio, to January, 1863. 1st Brigade, 1st Cavalry Division, Army of the Cumberland, to July, 1863. 3rd Brigade, 1st Division, Cavalry Corps, Army of the Cumberland, to November, 1864. 3rd Brigade, 1st Division, Cavalry Corps, Military Division Mississippi, to January, 1865. 2nd Brigade, 1st Division, Cavalry Corps, Military Division Mississippi, to August, 1865. SERVICE.--Moved from Bardstown, Ky., to Nashville, Tenn., March 26, 1862, thence to Wartrace, Tenn., April 8, and duty in that vicinity until July. Action at Lebanon May 5. Readyville June 7. Rankin's Ferry near Jasper June 18. Shell Mountain June 21. Battle Creek June 21 and July 5. Murfreesboro July 13 (4 Cos.). Moved to Tullahoma July 13, and duty there until August. Sparta August 4 (Detachment). Raid on Louisville & Nashville Railroad August 19-21 (Detachment). March to Louisville, Ky., in pursuit of Bragg August 22-September 26. Pursuit of Bragg into Kentucky October 1-22. Near Perryville October 6-7. Near Mountain Gap October 14 and 16. Duty on southern, border of Kentucky until February, 1863. Ordered to Nashville, Tenn., February 9, thence to Murfreesboro and Franklin, Tenn. Expedition to Spring Hill March 4-5. Franklin March 4. Thompson's Station, Spring Hill, March 5. Expedition from Franklin to Columbia March 8-12. Thompson's Station March 9. Rutherford Creek March 10-11. Spring Hill March 19. Near Thompson's Station March 23. Little Harpeth March 25. Near Franklin March 31. Thompson's Station May 2. Franklin June 4. Triune June 9. Middle Tennessee or Tullahoma Campaign June 23-July 7. Uniontown and Rover June 23. Middleton June 24. Fosterville, Guy's Gap and Shelbyville June 27. Expedition to Huntsville July 13-22. Passage of Cumberland Mountains and Tennessee River and Chickamauga (Ga.) Campaign August 16-September 22. Maysville, Ala., August 21 and 28. Reconnaissance from Alpine, Ga., toward Summerville September 10. Skirmishes at Summerville September 10 and 15. Battle of Chickamauga September 19-21. Moved to Bellefonte, Ala., September 25-30. Operations against Wheeler and Roddy September 30-October 2. Moved to Caperton's Ferry October 2, and duty there until December 2. Moved to Rossville, Ga., December 2-5, and duty there until January 6, 1864. Scout toward Dalton December 12, 1863. Skirmish at Lafayette December 12. Scout to Lafayette December 21-23. Veterans on furlough January to March, 1864. Near Chattanooga until May. Atlanta (Ga.) Campaign May to September. Duty in rear of army covering and protecting railroad at Wauhatchie, Lafayette, Calhoun, Dalton and Resaca. At Wauhatchie May 5 to June 18. (A detachment at Lexington, Ky., June 10, 1864.) At Lafayette until August 4. Actions at Lafayette June 24 and 30. At Calhoun August 4 to October 12. Pine Log Creek and near Fairmount August 14. Resaca October 12-13. Near Summerville October 18. Little River, Ala., October 20. Leesburg October 21. Ladiga, Terrapin Creek, October 28. Moved to Louisville, Ky., November 3-9. Operations against Lyon in Kentucky December 6-28. Hopkinsville, Ky., December 16. At Nashville, Tenn., until January 9, 1865. Moved to Gravelly Springs, Ala., and duty there until March. Wilson's Raid from Chickasaw, Ala., to Macon, Ga., March 22-May 1. Six-Mile Creek March 31. Selma April 2. Montgomery April 12. Wetumpka April 13. Fort Tyler, West Point, April 16. Capture of Macon April 20. Duty at Macon and in the Dept. of Georgia until August. Mustered out August 21, 1865. Regiment lost during service 1 Officer and 30 Enlisted men killed and mortally wounded and 1 Officer and 148 Enlisted men by disease. Total 180.